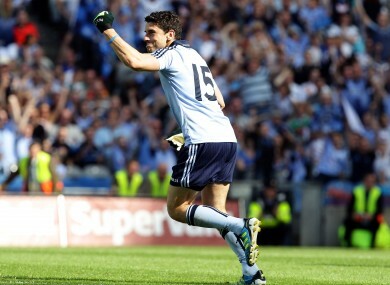 Dublin's Bernard Brogan celebrates scoring the winning point from a free kick during the final moments of the match. KEITH BARR INSISTS in this morning’s Irish Independent that it was the wrong decision while John Fogarty in the Irish Examiner writes ‘the view of this writer from the press box showed referee Cormac Reilly was correct to award the free’. Whatever the merits or otherwise of the official’s late, late call, Bernard Brogan tapped over the point and Dublin booked their place in another Leinster SFC final. The Lilywhites had battled back in the second half at Croke Park, enjoying a numerical advantage thanks to Eoghan O’Gara’s dismissal, to get level in the final moments. Then Andriú Mac Lochlainn was adjudged to have stopped the Footballer of the Year from getting out to the ball. The pundits and journalists seem split. What’s your view? Email “Poll: was the referee right to award Dublin a last-minute free yesterday?”. Feedback on “Poll: was the referee right to award Dublin a last-minute free yesterday?”.